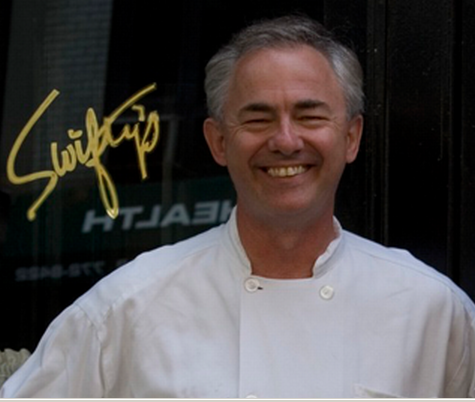 Swifty’s Will Make Your Feel Rich, But The Food is Light, Modern and Better Than Ever. Hours of Operation: Open for Lunch & Dinner. There are three reasons to check out this long, narrow restaurant, peppered with pictures of Swifty, celebrated restaurateur Glenn Bernbaum’s perky pug. The most obvious is if you live in the neighborhood. The second is if you’re an in-the-light socialite (or wanna get a glimpse of some notable examples). The last is for some unexpectedly good food by executive-chef Stephen Attoe.Even the Melba Toast is house-made and delicious. Appetizers are just stylish enough to be fashionable — just familiar enough not to offend: Corn Fritters with Alaskan Salmon Roe and Crème Fraiche was as downtown-a-dish as Jumbo Lump Crabmeat on Tomato Aspic was fancied-up steak house. East/West Coast Oysters were beautifully fresh and a perfect compromise, between old and new. Entree fare includes the signature "twin burgers" with delicious slaw, and fries, the noteworthy Crab Cakes; a beautifully grilled Angus Strip Steak with Béarnaise sauce and fabulous Fries; and specials such as cooked to perfection Roasted Loin of Venison, Braised Red Cabbage, Gratin Potatoes. Swifty’s Is Also Doing A Sunday Evening Lobster Dinner For Two With Choice Of Field Green Salad Or Corn Chowder, Homemade Ice Cream, Sorbet Or Cookies And A Bottle Of Either Red or White Wine For Just $125.00. Now that’s a real deal and the lobster is tender and juicy (2 steamed or grilled 1 & 1/4 pound Maine Lobsters, slaw & those fabulous fries). 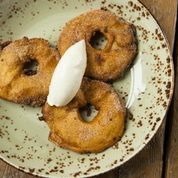 Desserts are all homemade American adaptations and some are extraordinary, such as Classic Vanilla Meringue Cake that is light and luscious, Granny Smith Apple Galette, with Creme Fraiche and Lemon Pound Cake with whipped cream. Inquire if the Chocolate Soufflé is available, if so, go for it. The homemade Ice creams make a great sundae and what classic meringue cake! The wine list is small and offers some good values under $60, like Chateau-Fuisse, Pouilly Fuisse, Tete de Cru, 2009 for $58: a best buy. Service is very friendly and accommodating. On our visit, the Maître d’ Romana was wonderful. 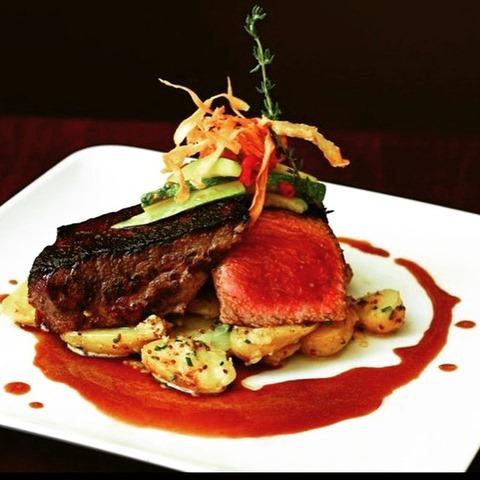 Since chef Stephen Attoe is part owner, he is hands on and in the kitchen, which explains the carefully prepared food. Swifty’s may be a club, but first timers get a warm welcome. For an extraordinary treat, observe the regulars and order a sometimes-on-the-menu Cheese Soufflé with Mustard Sauce. It is arguably the best in town. (It has now been added to the menu and remains a paragon of perfection). Chef Philippe is also available to cater private parties and/or prepare to-go dinners for any special event, at your home, boat or on the beach. 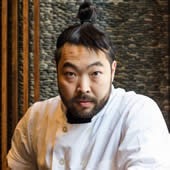 Since opening in December 2005, Philippe Chow New York City continues to attract the who’s-who of Hollywood and social set – frequented by such names as Anne Hathaway, Anna Wintour, Beyoncé, Robert De Niro, Oprah, and Lady Gaga – headed by Executive Chef Philippe Chow. The Chic modern design meets with a signature color palette of black, white and red in the dining room and bar; for a more intimate setting, the private cellar and two private rooms are an ideal setting for any fête. 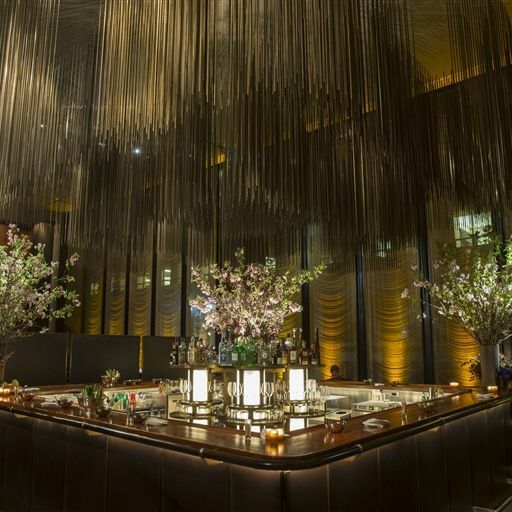 Plush banquettes and intimate booths lend an air of opulence, as the glow from flickering candles and overhead skylights set the tone for a luxe dining experience. Service is surprisingly warm,efficient and guiding, and has improved since Steve Boxer entered the scene. The menu offers a selection of main dishes meant to be shared by two people (many of them can be ordered in1/2 portions, but not the superlative Peking duck with its light-as-a-feather handkerchief-pancakes or a whole steamed fish of the day. Creative noodles and dumplings are a specialty at Philippe. Each night at about 9 p.m. in the restaurant’s dining room, Noodle and Pastry Chef conducts a live demonstration for making hand-pulled noodles. Philippe’s menu features no less than eight variations of either steamed or stir-fried dumplings and Cheng’s specialty, hand-made noodles with pork or veal bean sauce (like a Bolognaise). A haute flair on classic Chinese cuisine, Chef Philippe has crafted a menu complete with signature-favorites. We enjoyed an assortment of steamed dumplings, including Jade dumplings with shrimp and water chestnuts, crabmeat soup dumplings, sieu mai of pork and black mushrooms and vegetable dumplings. All were paragons of freshness and avoided the all too common NY Chinese trait of gumminess. PORK/SHRIMP FRIED RICE was creatively presented in a tall urn and was another standout, as were terrific sautéed green beans. Entrees range from nine seasons spicy prawns, drunken sea bass served in white wine, the aforementioned Peking duck, crispy beef that is to die for and a delightful combination of green prawns with cashew nuts, water chestnuts, peppers and black mushrooms. Best of all and obligatory are RED KING CRABS (2.5 – 3lbs) in garlic/butter sauce. They can be shared by 3 or 4 people and are so good that you will never want lobster again. Other Signature Dishes include Chicken Satay, skewers prepared in Chef Philippe’s famous cream sauce, crispy Peking Chicken, fresh and juicy Maine Lobster and Spring Rolls. 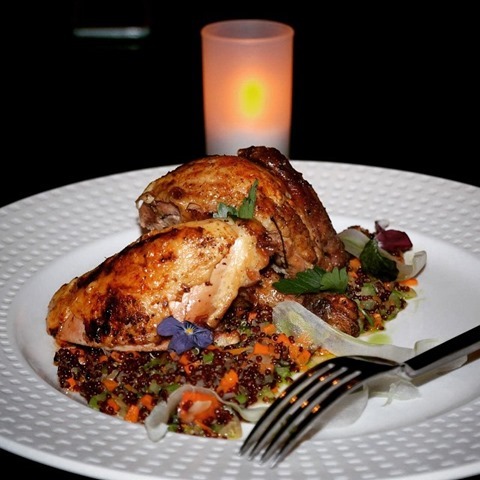 Philippe also offers a multi-course tasting menu at dinner that must be ordered by a minimum of six persons. 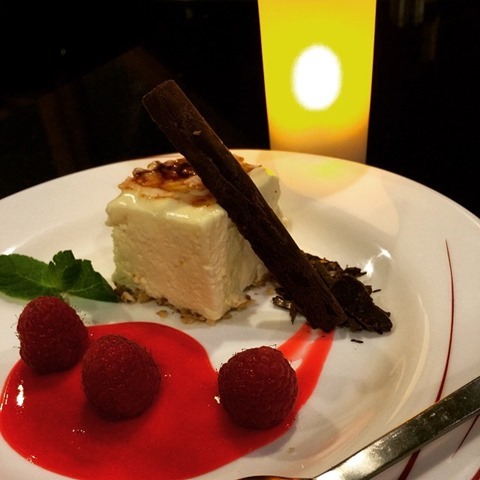 The best dessert is without doubt the fine house-made sorbets and fresh fruit. 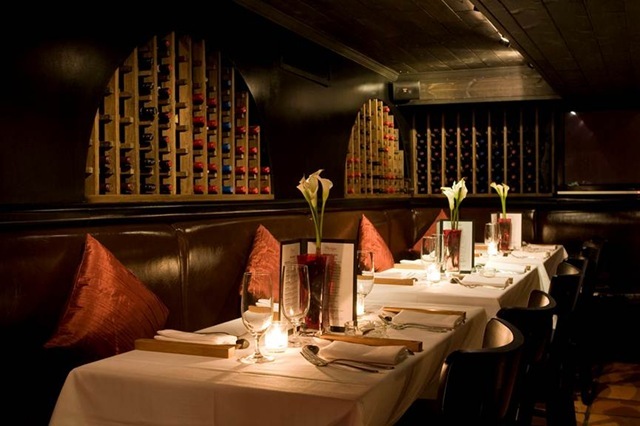 Philippe offers 10 to 12 wines by the glass each night, as well as a good if pricey wine list. 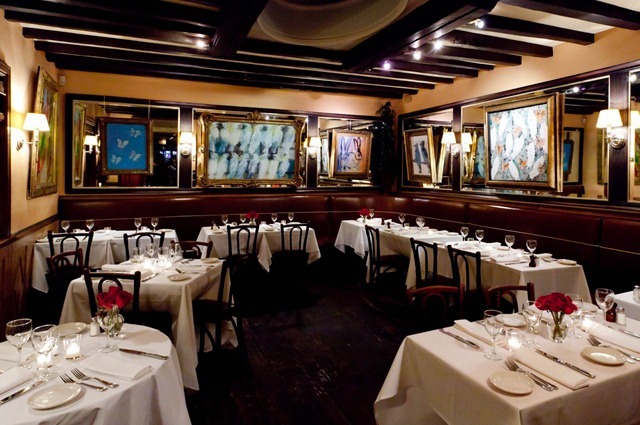 Philippe Chow New York is the perfect night-out-on-the town and rates A MAJOR on The Walman Report. (Hosting your own soiree? Chef Philippe is also available to cater private parties and/or prepare to-go dinners for any special event). 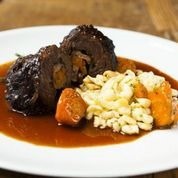 Stanton Street Kitchen is a restaurant, wine bar and beer cellar, curtsey of renowned master chef ,(formally of the fabled “21” restaurant,) Erik Blauberg, SSK features a unique beer cellar offering more than 100 different varieties of bottled beers from around the world,. There are also 24 rotating seasonal drafts and an extensive wine list with reasonably priced selections. 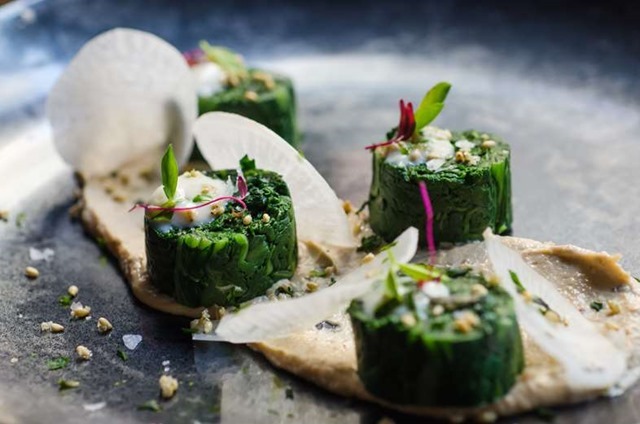 Chef Blauberg created a menu of small plates designed to pair with the beer and wine offerings, allowing guests to create their own tasting menus. There is also a “chef’s feast” tasting menu featuring seasonally inspired dishes, available to guests who are seated at the 14-seat bar.The menu which changes regularly, features an assortment of “beer bites” served on toast such as spicy prawns with cracked corn, jicama, and cilantro; figs with goat cheese and 50 year-old sherry; a delicious braised pork belly with red cabbage and toasted peanut slaw. 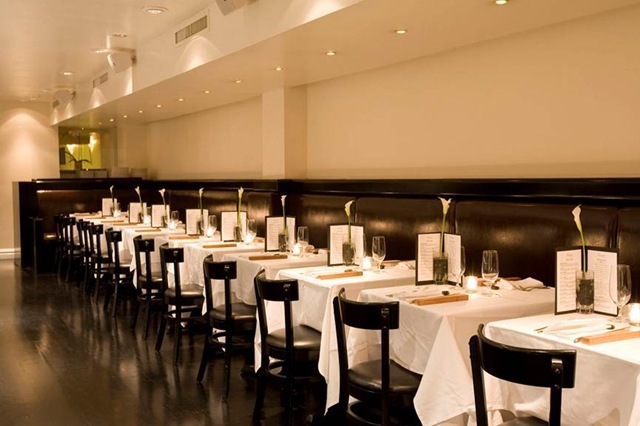 Small plates such as sugar pea risotto with cepes and squash; feather-weight tagliatelle with hen of the woods mushrooms and wild boar sausage; and port-braised oxtail with foie gras and fava bean ravioli. 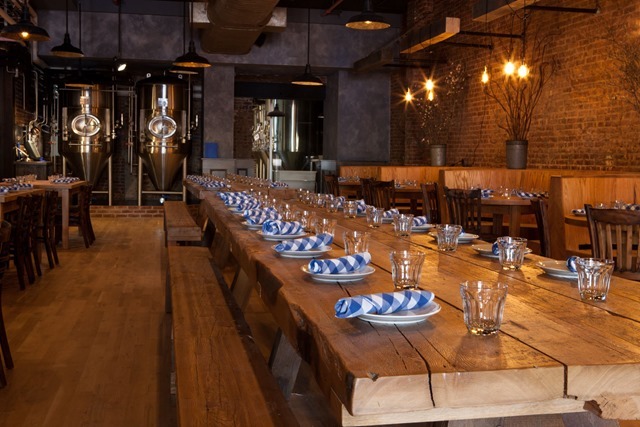 The beer cellar also highlights a private chef’s table with seating for up to 30 guests. The sparse, clean design offer lots of candles, wood and oodles of romance. The service is warm, friendly and knowledgeable. 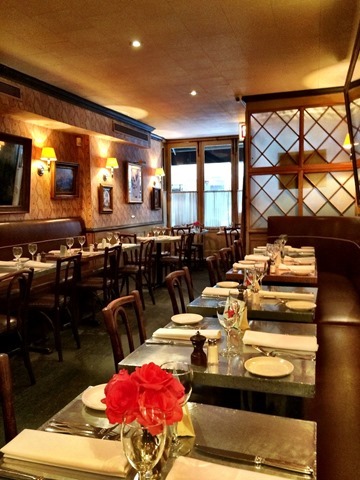 Beyond fabulous, Stanton Street Kitchen is located at 178 Stanton Street and is truly one of NY’s best small restaurants and rates A Major on The Walman Report. Germany In New York, Paulaner Offer Great Food, Great Beer and More Fun Than . . . .
Paulaner is located at 265 Bowery just south of Houston Street in Manhattan (easily accessible by subway, F 6 B M D trains 2 blocks away; N R in Soho), www.paulanernyc.com,212-780-0300, and is open Sun-Wed 11 am-midnight; Thurs-Sat 11-1 am. 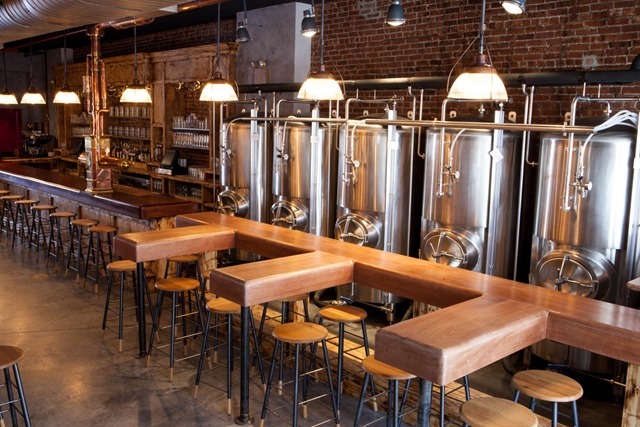 The space (including a private downstairs party room that accommodates 65 people) is available for private parties, beer classes, brewery tours, corporate team building and other corporate meetings. 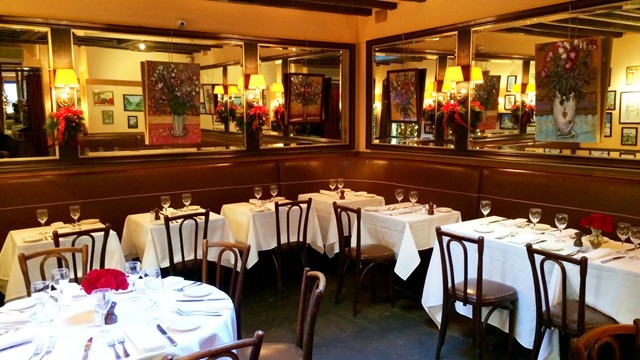 For more information on special events, please contact Maria Cocchiara-Klein at 212-780-0300. With Edi & the Wolf, Wolfgang Ban helped reinvent the experience of a Heuriger, a rustic wine-tavern serving straightforward, simple cuisine. With Paulaner, Ban (also of Michelin-starred Seäsonal) takes reinvention a step further, situating his latest contemporary Bavarian restaurant directly inside an active microbrewery. Paulaner is a modern take on the traditional beer hall with great food. It’s a hip and lively meeting place where large groups of friends can settle in at long communal tables, where reclaimed wood provides a warm contrast to the industrial chic of imposing copper and steel fermentation tanks; a place where everything from the beer to the bread, the sausage to theschnitzel, the pretzels to the stollen, is made in-house with locally sourced ingredients. 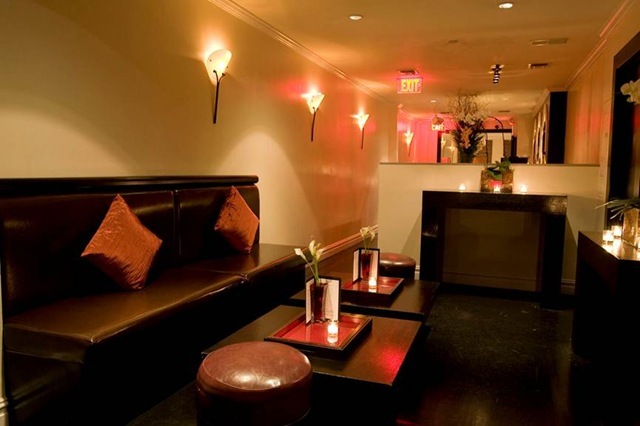 Downstairs, there’s a private room for more exclusive or intimate parties. At the center of the action, Master Brewer Andreas Heidenreich creates his own versions of the traditional Paulaner-style beers with recipes of his own invention, while following the Purity Law of 1516; he uses only four ingredients—water, wheat, hops and yeast. No spices, fruits or other enhancements are used to create Hefeweizen, lightly hoppy with subtle bitterness balanced with fruity character, Munich Lager, a classic bright amber beer, and Munich Dark, rich dark amber with a malty flavor. Heidenreich has also createdMunich Pale Ale exclusively for New York City, a top-fermented IPA-style beer with three varieties of hops, including Amarillo from Washington State, and a changing roster ofseasonal beers. This season it’s the Winter Bock, a strong dark beer with smoky, roasted aromas and malty caramel flavor. There is no fresher beer than the unfiltered, unpasteurized “Tank to Table” brew, which is also available for takeaway in growlers and mini-kegs. Meanwhile, in the kitchen, Executive Chef Daniel Kill creates simple, yet sophisticated fare that tastes even better when matched with Paulaner’s beers and wines. Both his background and his training contribute to his culinary style. A native of Bavaria who grew up on beer and brats, he rose to the top of his profession at Munich’s Michelin-starredTantris and as Executive Chef of Wallsé, Café Kristall, Café Sabarsky and Blaue Gans. The food is outstanding. A great, traditional starter that will be new to many is Obazda, a blend of creamy Camembert, butter, beer and spicy red pepper served with a freshly baked pretzel, still warm from the oven. (the pretzel warrants a trip to the restaurant on it own) Try it with a Hefeweizen, the most popular Paulaner beer. Then, move on to Chef Daniel’s authentic house-made sausages: Weisswürste, delicate tasting veal and pork sausage; snappy Bratwurst (our favorite), a blend of pork and beef; lightly gamey Lamb Sausages; and the Paulaner, a smoky, dry-aged beef sausage made with beer and local cheddar cheese. Or order the Sausage Sampler (ideal for two or more) along with a flight of beers and discover your favorite combination. 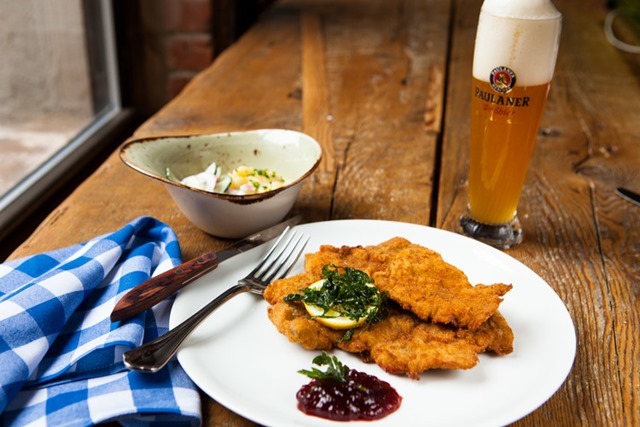 The Wiener Schnitzel here is an iconic expression of the classic: pounded slices of tender veal, breaded and fried until golden brown and perfectly crisp balanced with sweet-tart lingonberries. The irresistibly crisp-skinned, juicy Pork Knuckle with roasted potatoes is amazing and the Whole Roasted Duck with pretzel dumplings are sized for sharing. g There’s no more convincing reason to save room for dessert than the qualities associated with freshly baked goods (warm, fresh, aromatic). 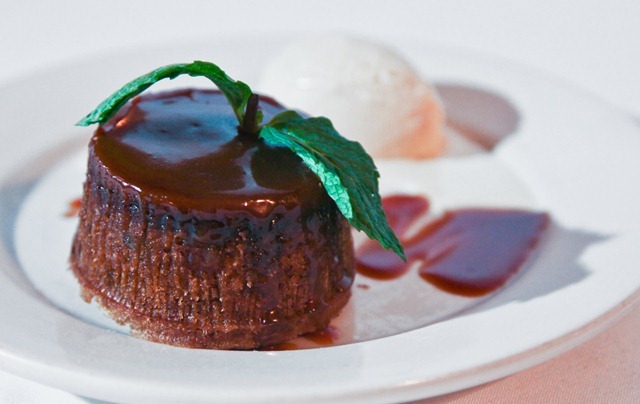 Selections include a perfect Sachertorte, chocolate cake with whipped cream, Warm Pear Strudel with caramel brittle ice cream, hot Apple Fritters with vanilla ice cream and Sweet Buns with apricot jam and vanilla sauce. 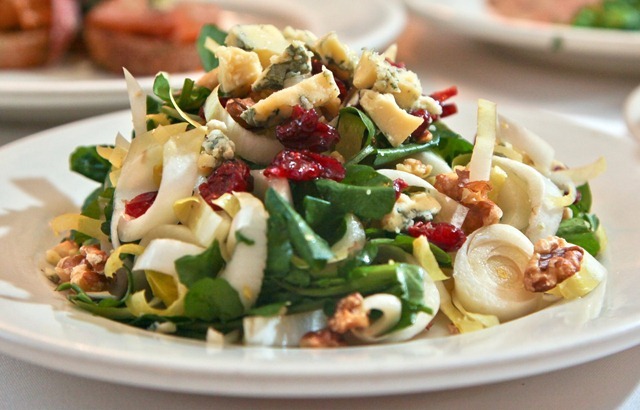 Weekend brunch is another special experience—a Bavarian spin on conventional New York brunch. It’s hard to choose between savory options such as crispy and tender PorkSchnitzel or Rösti, a crispy potato pancake paired with house-cured salmon and crème fraîche. Sweet selections include Kaiserschmarrn, a fluffy pancake meets bread pudding with raisins and fruit compote. Every table is also treated to a complimentary basket of freshly baked breakfast breads, including croissants, muffins and brioche served with jam and butter, as well as a choice of a free brunch cocktail—Mimosa, Bloody Mary or your choice of beer. Beyond just beer, Paulaner is also distinguished by its excellent wine list—featuring German, Austrian and local wines by the glass and by the bottle including a selection of Rieslings, and a variety of reds like Blaufränkisch Reserve Moric Burgenland. 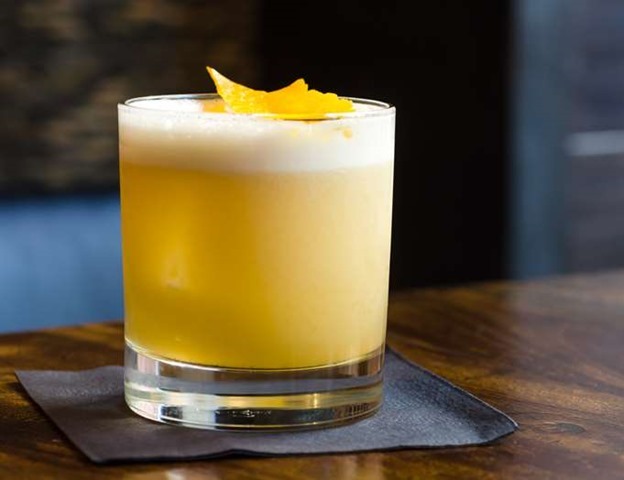 The cocktail menu incorporates beers, local craft bourbons and whiskies (also available in tasting flights), wine and other spirits. One favorite cocktail is the RyeZirBaska, rye, stone fruit liqueur, snaps and bitters. An aged, dark beer snaps, produced in collaboration with a Westchester, New York-based spirits maker, is currently under development. For the holiday season, Paulaner has set up a retail bakery near the entrance, featuring house-baked goodies, including hearty Rye Bread. Sweets include melt-in-your-mouth sugar-dusted crescent-shaped butter cookies called Vanillekipferl, fudgy Rum Balls and jam-filled almond flour cookies. There’s also Christmas Stollen, the delicious fruitcake studded with dried fruit and nuts and topped with a light coating of icing. NEW YORK (November 3, 2014) – It’s the most iconic location in the world to celebrate New Year’s Eve — Times Square in New York City, where the famous ball drop has taken place for over 100 years to herald in the new year. This year the New York Marriott Marquis makes it even more exciting. 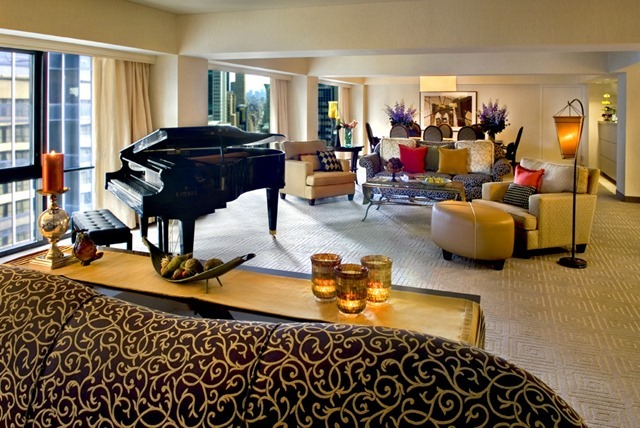 Guests who book the Ultimate Luxury New Year’s Eve package will arrive via private limousine to the sounds of a baby grand piano in a sumptuous presidential suite as they get ready to usher in the new year. Their private attendant will greet them with Piper Heidsieck champagne and the chef’s selection of festive hors d’oeuvres, as they explore this spacious two-bedroom suite, decorated in celebratory style. Then it’s time to primp with a personal stylist from PRIMP Salon & Spa Services for the gala party below in Broadway Lounge, where they’ll be seated in the prime ball drop-view seats, overlooking the thousands of people gathered for the big countdown at midnight. And, as a warm-up to the countdown, earlier in the evening they’ll enjoy a surprise visit outdoors to Times Square, surrounded by the crowds. In Broadway Lounge, they’ll enjoy a full evening of entertainment, special buffet dinner menus, premium bars and dancing, as midnight approaches. Then it’s countdown time, when the air is filled with a storm of confetti throughout Times Square, as the famous Waterford crystal ball descends. The new year starts off in the morning with breakfast at Crossroads; the perfect ending to the celebration and the perfect beginning to 2015. Not keen on the idea of being outside in the cold weather in Times Square with family or friends for the countdown to midnight? For the first time ever, the New York Marriott Marquis will sell “Ball Drop View to New Year’s Eve in Times Square” guest rooms on marriott.com. Guests can pass up the outdoor experience, staying cozy inside, in their comfortably appointed guest room to watch the festivities, without having to bundle up. This is a 3-night stay with arrival on December 29 or December 30. The entire 3-night stay is just under $6,000 and is inclusive of tax ($5,745.70 total). For guests who are looking forward to a celebration, individual tickets are still available to the gala party in Broadway Lounge, described above. Individual tickets range from $1,000 per person for communal seating, to $3,500 per person for prime view ball drop seating. Please note these tickets do not include a hotel guest room or overnight stay. The New York Marriott Marquis is located on Broadway between West 45th and West 46th Streets, in the heart of Times Square. Sachi is located at 713 Second Avenue at 38th Street, 212-297-1883, www.sachinyc.com and is open seven days a week, Mon-Fri, 12-3pm (lunch), 5-11:30pm (dinner), Sat, 12-11:30pm and Sun 12-11pm. Takeout, delivery and weekend traditional dim sum brunch with pushcarts are coming soon. 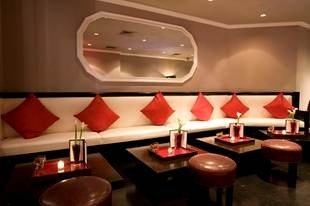 Sachi is available for private parties and special events. For more information, contact David Chan. Sachi is a completely new kind of Asian bistro, offering fun and inventive interpretations of authentic Asian cuisine with a menu created by Pichet Ong, a multiple James Beard Award nominee and culinary consultant specializing in menu development, and Andy Yang, creator of Rhong-Tiam, the first Thai restaurant in the U.S. to receive a Michelin star. Sachi’s menu features familiar street food and classic dishes that have been elevated with the finest ingredients and re-imagined with personal twists that surprise, ranging from dim sum to noodles, Grade-A sushi and sashimi, to entrees with influences and inspirations from China, Japan, Korea, Vietnam, Thailand and Singapore—all designed to be shared. Inspired by the Southeast Asian cooking they grew up on and their travels around the world, Yang and Ong bring us healthy, inspired versions of authentic Asian foods, using high heat and little oil. Yang, known for his spicy, multi-layered Thai food, comes up with an idea for a dish, and then Ong twists it around, adding unusual accents or a surprising dipping sauce, always ensuring that it all works together. The result is power food—clean and light—that gives you energy and nourishment, but is always delicious and deeply satisfying, accessible and affordable. 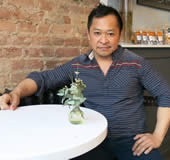 Management powerhouse David Chan of the Amber Group, who has opened 15 successful restaurants, heads the team as General Manager. Thoroughly knowledgeable about all aspects of food, beverage, and service, his greatest strength is building strong teams and empowering them through leadership, example, and inspiring service and hospitality. One of the strengths of this team is that many of the members have worked well and closely together in the past. To design the interior, Chan brought in Phakkapol Pasuthip, a trained architect and interior designer from Thailand, who also designed Yang’s Rhong-Tiam. 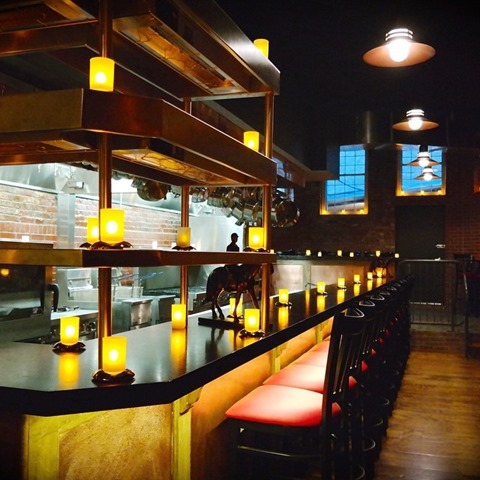 Using existing elements from the restaurant that formerly occupied the space, he completely reimagined it. Reflecting the logo of the restaurant, the design embodies the number 8, a symbol of good luck. From the front of the restaurant, the eye is drawn from the miniature Tibetan twin pixiu statues at the entrance to the life-size twin forms (also symbols of good luck) set against the stone waterfall wall in back, creating a sense of perspective. 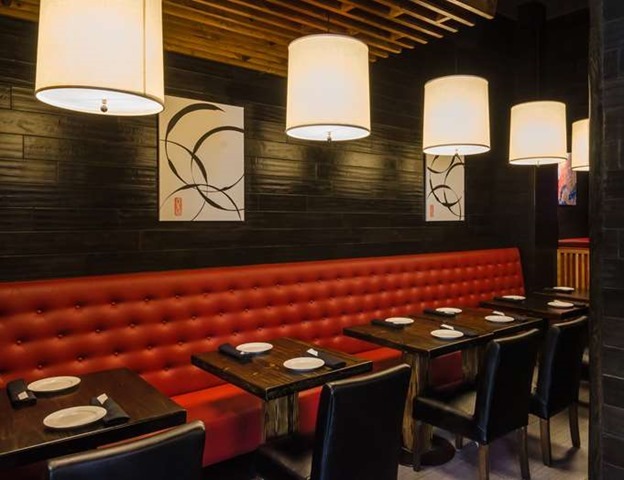 Strong vertical lines in dark-stained pine wood panels extend across the space, producing a clean, sophisticated and calming atmosphere, while also dividing the space to create a sense of intimacy for each group of diners, seated on red banquettes. The zinc-topped bar with a golden patina, is lined with green-beige stone. 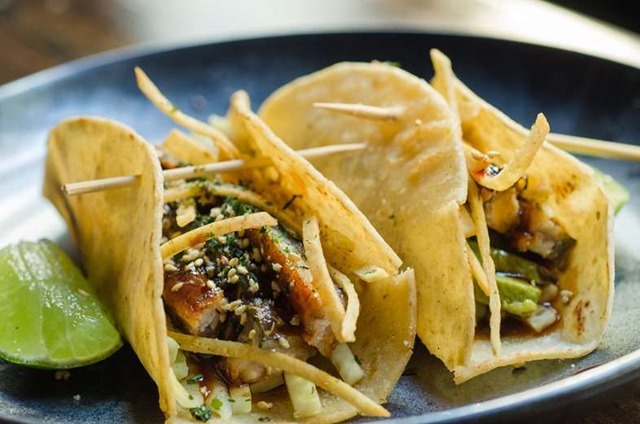 Inventive starters borrow from different cultures: Eel tacos turn the familiar eel avocado roll on its side, filling a soft taco wrapper with barbecued eel, cucumber, sesame and soy barbecue sauce. Uni Chawanmushi is a beautiful rendition of delicate silky egg custard, served warm and embedded with sea urchin, crab and mushroom. While Teriyaki Octopus changes your perception of both teriyaki and octopus, with tender tentacles flavored with orange and kaffir lime, accompanied by spiced sweet potatoes. Even simple Tomato Egg Drop Soup is transformed: the tomatoes are slow-roasted, the base broth is made from organic chicken bones for much more intense flavors. Meat and fish entrees shake up your taste buds. A classic Vietnamese beef stir-fry, Bo Luc Lac, is prepared with the classic sauce but substitutes the finest rib eye and blistered shishito peppers. 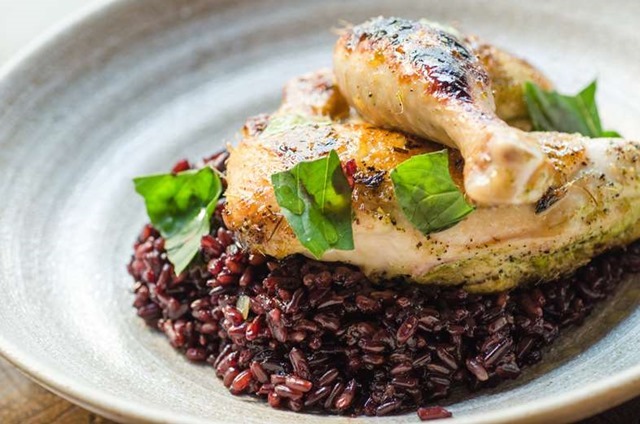 Lemongrass Poussin is brined, slow-cooked with circulated air in the combi oven for evenly cooked juicy meat, and finished with a blast of heat to make the skin crisp, and served with Asian greens and black rice. And the Lobster Roll is an Asian-influenced reinvention of the classic American, with miso brown butter, crispy bacon and yucca fries. Noodle and rice dishes are mind-blowing in both their simplicity and in the amazing flavor profiles: Chicken Lo Mein is prepared with house-made hand-pulled noodles, high quality soy sauce and house made tofu; Dan Dan Duck Ramen is prepared with a spicy duck ragu, Sichuan peppercorn, tofu and duck crackling over toothsome noodles; and Oink Oink Oink Fried Rice has the flavor of wok hay (the breath of the wok) infusing the rice and the three kinds of pork—pork belly, Chinese sausage, and bacon. Entrée stars include SHAKING BEEF, Wok charred beef, tomato, red onion, shishito, celery, roasted salt & pepper and BRAISED SHORT RIB MASSAMAN CURRY, with Coconut, peanut, toasted brioche (the real star of the dish). Creative sushi and sashimi rounds out the menu with inventive sushi rolls such as breakfast futomaki, inspired by a New York favorite (bagels and lox) with salmon, tamagoyaki, cream cheese and red onion in a soy paper wrapper; scallop and crisp bacon rolled together with pineapple and vanilla caramel; and eel and buffalo mozzarella with radish greens and heirloom tomatoes. 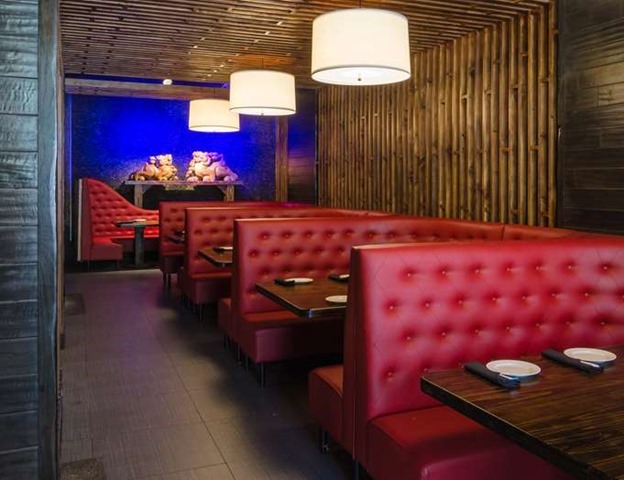 But you’ll also find classic sushi and sashimi by the piece or by the platter. The desserts are all Pichet Ong with wonderful Asian accents. Notably famous for his desserts at Spice Market, Rick Moonen’s RM and Jean Georges, named one of the Top Ten Pastry Chefs in America by Pastry Arts & Design and Chocolatier, and was selected as a “Pastry Provocateur” by Food & Wine, Ong has come up with completely original creations for Sachi. 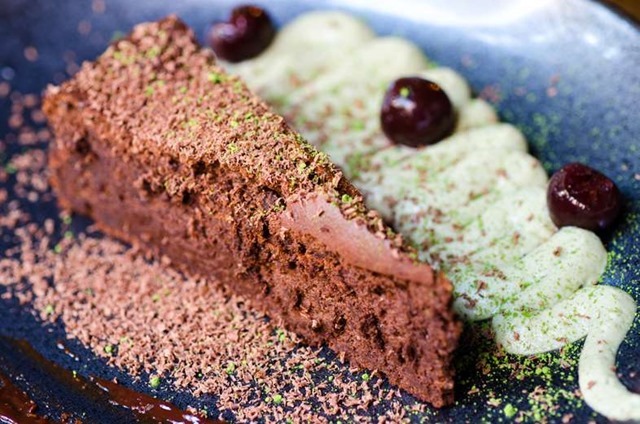 They include: caramelized ginger custard with brown sugar, orange and graham cracker; sesame and milk chocolate ice box cake; and yuzu meringue pie with condensed milk and coconut cookie crumbs. Lapsang souchong tea-infused bourbon, blackberry liqueur, fresh pressed lemon juice, served over crushed ice, and the Mehkong Martinez, complex with Thai sugar cane rum, Noilly Prat sweet vermouth, Luxardo Maraschino liqueur, Regan’s orange bitters, served up, and The Jade Lantern, bright green and bracing with vodka, Matcha green tea, lemon juice and mint leaves, shaken and served over ice. The wine list focuses on wines that pair well with Asian flavors, sparkling wines such as Prosecco and Cloud Chaser rosé, as well as several other options by the glass: whites such as Marlborough Estate Reserve Sauvignon Blanc and Urban Nik Weis Riesling, and reds like J. Lohr’s Falcon Perch Pinot Noir and Firestone’s Merlot, as well as a selection of bottles. There’s also a selection of sakes such as Osakaya Chobei Daiginjo, and Ozeki Nigori Junmai, plum wine and beers on draft such as Sapporo, Angry Orchard Cider, Southampton Double White, as well as a selection of Asian, domestic and European bottled beers. Service is outstanding: knowledgeable, attentive and caring. And Here is the place to enjoy creative cocktails. They are what most are not: delicious and potent.